As with a lot of tech purchasing decisions, when it comes to buying a memory card you can’t just click on the first result that appears on your online retailer of choice and that’s that—today’s memory cards, with their small sizes and huge capacities, have features and specs all of their own. Here’s what you need to know. In addition to the raw write speed there’s an extra spec to be aware of for higher-end cards: Ultra High Speed (UHS). This is usually written as U1 (write speeds of at least 10 MB/s, like Class 10) or U3 (at least 30 MB/s), but you might also see references to UHS-I, UHS-II, and UHS-III in card specs. These are the potential speeds of the card architecture (the bus speeds) rather than raw transfer speeds, so while related, they’re not actually the same. Don’t worry too much about UHS-I, UHS-II, or UHS-III—look for U1 or U3 instead—but if you see them, you know what they are. Theoretical data transfer rates of 104 MB/s are possible with UHS-I, 312 MB/s with UHS-II, and a whopping 624 MB/s with UHS-II, while cards without a UHS rating are stuck at 25 MB/s. However, the flash memory itself and the connected gadgets need to be able to support those bus speeds too. Some cards, particularly older or cheaper ones, will just quote a maximum read or write speeds (as opposed to the minimum write speed indicated by the Speed Class rating)—although it’s important to note that this is usually a maximum rating that you won’t get consistently. They might also quote a figure like “150x”, which essentially means how much faster it is compared to the read speed of a CD. But that’s an outdated reference, which is why you don’t see it used much any more. There’s one more spec to talk about, the new Video Speed Class which is designed to help you pick the right card for saving 4K or even 8K video. You’ve got V6 (write speeds of up to 6MB/s, like Class 6), V10 (up to 10 MB/s, like Class 10), V30 (up to 30 MB/s, like U3), V60 (up to 60 MB/s), and V90 (up to 90 MB/s). Video Speed Class appears on the fastest and newest XC cards, so look for it if you need top performance. If you’re still with us, congratulations. You’re not quite home and dry just yet though, because as well as working out the spec you need, you also need to make sure it’s actually going to work in your device. Not all card types or all capacities will work in all phones and cameras, particularly if you’re using a gadget that’s a few years old. Thankfully, your devices should prominently list the memory cards they’re compatible with, and might even offer some recommendations for a minimum Speed Class. Most Class 10/U1/V10 cards will handle 1080p video comfortably, but for 4K footage it’s a good idea to go up to U3/V30 instead, otherwise you run the risk of losing frames resulting in stuttered video. 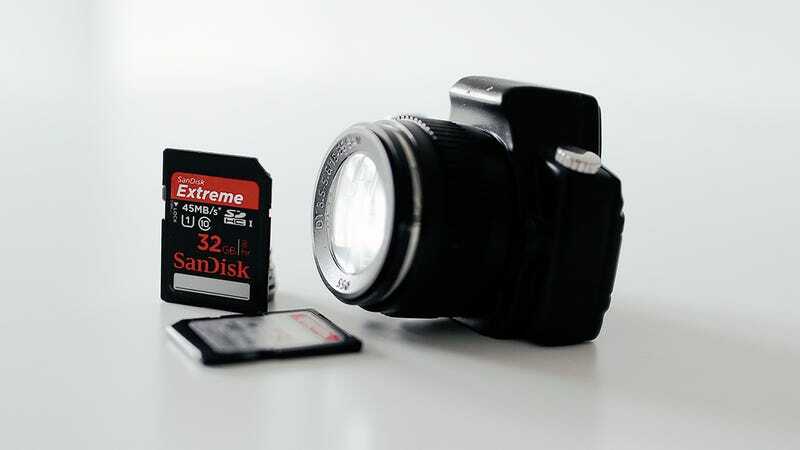 It’s also worth noting that your choice of memory card doesn’t affect the quality of your photos or videos—but more expensive cards can save and process files faster, more reliably, with less chance of errors, and with a better chance of file recovery if the data gets erased. When you’ve got billions of incoming pixels from a 4K video capture, those are very important factors to consider. There’s some backwards compatibility between new and old standards, so a device capable of reading SDXC cards will be able to read SD and SDHC cards too, albeit at slower speeds. But the reverse isn’t true, so you can’t just stick an SDXC card in a gadget that only supports SD and SDHC. As we’ve said, it should be fairly easy to find out which cards are compatible with a given device, but you’ll want to make sure to double-check each time. (The Nintendo Switch, for example, needs a UHS-I card). When you’ve got a handle on the speed you need, you can then decide how much capacity you want, or can afford. The highest capacities (currently 512GB) are usually very expensive, as the tech that makes them possible is only just out of development. So you might find a better value with a smaller card. But as with read and write speeds, you’ll also want to make sure you’re not spending a lot of money on a giant card that’s actually too big for your phone or camera to deal with. The most important thing is to first confirm what formats and capacities it supports.